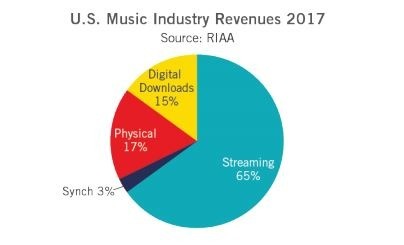 In 2017, U.S. music industry revenues jumped 16.5 percent in retail value and 12.6 percent in wholesale value, to $8.7 billion and $5.9 billion, respectively — growth that's attributed nearly entirely by RIAA to growth in paid subscriptions to streaming services. Streaming music revenues reached $5.7 billion in 2017, compared with $4 billion in 2016 and $2.3 billion in 2015, the year Apple Music launched. Streaming services crossed 50 percent of the industry's revenue for the first time last year. According to the RIAA, streaming comprised of nearly two-thirds of the industry's revenue in 2017, compared with physical (17 percent) and digital downloads (15 percent.) As streaming grew, digital downloads fell 25 percent in 2017. And while physical media revenue is far off its peak, it fell just four percent last year, to $1.5 billion. This continues a renaissance in revenue for the industry, which was battered for years by the collapse of its traditional model. In fact, 2017 marked the first time since 1999 in which U.S. music revenues grew for two years in a row. The RIAA release did not split out the revenues or market share numbers for the different streaming services. As of earlier this month, Apple Music had reached 38 million subscribers, and the service is expected to overtake Spotify, at least in the U.S., as soon as this summer. "Our story continues to be one of great promise, but our footing is fragile, and a sustained, durable recovery is jeopardized by a fundamentally uneven playing field," RIAA chairman and CEO Cary Sherman wrote in a Medium blog post this week, geared to the release of the numbers. He added, though, that the industry has not yet found a model for making sure artists are fairly compensated, especially in regards to the small amount of revenue that accrues to artists when their music is streamed on YouTube. "To the fan, there is often little difference between the multitudes of services available," wrote Sherman. "Yet the payouts to creators are very different and vastly impacted by outdated or abused laws and regulations."